Although cleft lip and palate deformities are one of the most common birth defects, that does not make living through childhood with one any easier. When we meet someone, the first thing we notice about them is their face: their eyes, nose and their smile. So, when a child has a large gap on their face, it is difficult not to notice. Because a cleft lip is so visible, children who do not have their clefts operated on when they are babies often must endure teasing, bullying and stigma attached to their appearance. This was the case for Rafael, a FACES patient. At 2 years old he is probably too young to understand the stigma of his condition, but his caregiver, Corina Hidalgo, understands intimately what Rafael has been through. Corina is not Rafael’s mother. She has four of her own children, but cares for Rafael as if he were her own. Rafael was born to a distant niece of Corina who was a teenager when she gave birth. The moment she saw Rafael after he was born, she wanted nothing to do with him because of his cleft lip. Corina, whose maternal instinct is obvious in the way she cradles Rafael, knew she had to step up with this child. She didn’t know what would become of the child so she told her niece she would take care of him. Corina and her husband incorporated Rafael into their own immediate family, raising him as their own son. Rafael’s transformation is truly remarkable before and after his surgery. Before his operation he had a wide gap in his lips, his teeth visible from the outside. 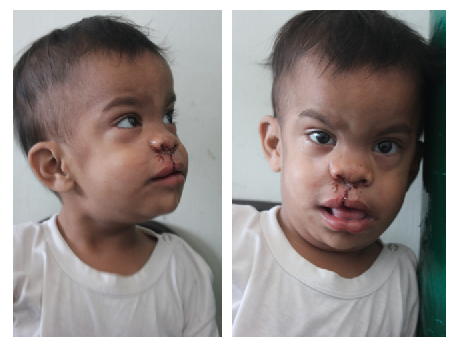 After several hours in the operating room, Rafael’s lip is closed and he no longer has a cleft. The next morning he sits on a chair in the recovery room, enjoying the attention from nurses, doctors and passing families. 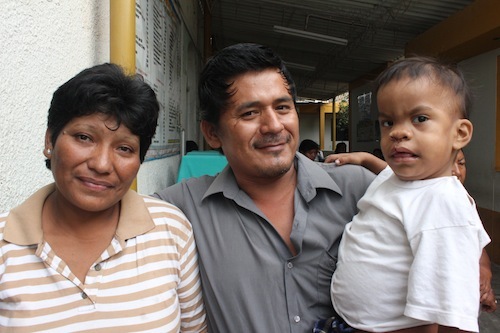 Within a matter of hours, the FACES surgeons were able to close Rafael’s open cleft lip. It is an operation that is relatively short, but absolutely life changing. Thanks to this operation, as well as the support of caring people like Corina, Rafael has a new chance at living a normal, stigma-free life. Corina, her husband and Rafael together after his surgery.